Let's Encrypt SSL certificate securing mail has been renewed on the Plesk server. 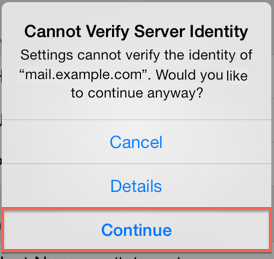 Mail server name is specified correctly in settings of mail client (iOS mail and MacOS mail). It matches the server name in the certificate at Plesk > Tools & Settings > SSL/TLS Certificates > Certificate for securing mail. Settings cannot verify the identity of "mail.example.com". Would you like to continue anyway? In iOS / MacOS mail client there is no "Trust" button on "Details" screen in the upper-right corner. iOS / MacOS issue: system does not allow the user to "trust" a SSL/TLS certificate if an already existing mail account is set up with a not certificate by default. Note: Interfaces on different versions of iOS / MacOS may vary. Get the certificate. The certificate can be exported from the browser to a .cer file. Press F12 > Security > View certificate. On the new opened window go to the Details tab and click on Copy file. It will open the export wizard. Click on Next. Select "DER binary coded X.509 (.CER)" and click Next. Upload the .cer file on iOS device through email, Safari browser or File Sharing and install it by clicking/tapping on the uploaded file. Set up the email account. If more information is needed on the certificate, it can be found in: Settings > General > Profile. Remove mail account from iOS / MacOS device. Re-create email account on iOS / MacOS device.